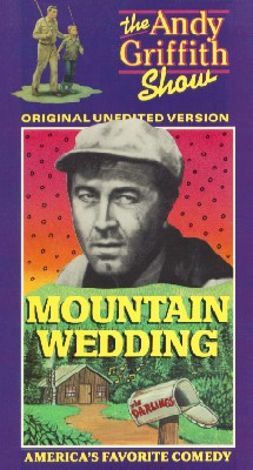 First telecast April 29, 1963, "Mountain Wedding" served to introduce Howard Morris as rock-throwing village idiot Ernest T. Bass. Hopelessly in love with Charlene Darling (Maggie Peterson), Ernest T. will not be dissuaded by the fact that "Chawrl-leyunn" is already married to Dud Wash (Hoke Howell), insisting that the girl ain't really hitched unless she goes through a "proper preacher weddin'." Thus, Andy and Barney arrive at the Darlings' mountain spread to make sure that Ernest T. does not try to kidnap the bride before the nuptuals. In addition to Maggie Peterson, Denver Pyle and the singing Dillard Brothers make return appearances as the rest of the Darling clan. "Mountain Wedding" was written by Jim Fritzell and Everett Greenbaum.